This is another recipe from Maria Elia, a chef I came across in my work for Foodepedia. I also got the Aubergine Mull recipe from her book which has proved to be a welcome addition to my kitchen. These meatballs are a nice alternative to beef or pork meatballs. I make them regularly as they are easy to make and taste great. The only thing to take care of with this recipe is to not overcook the meatballs because they will become tough or rubbery. With other meatballs I use milk-soaked breadcrumbs that prevent this drying out, but these ones don’t require it. But it also means you have to take care. The unusual addition of cinnamon gives this dish a subtle warmth and flavour that goes perfectly with the lamb. I’ve never added the dill and rarely the mint, as they’re not ingredients I have in the kitchen usually, but if you can add it, it would really make it a special dish. Finally, this recipe calls for the meatballs to be browned in a frying pan, but I always bake mine – it’s quicker and adds less fat. I also don’t dust my meatballs in flour, mainly because I’m lazy. The flour simply works to thicken the sauce, which you can do with a flour and water paste anyway. Put all the ingredients into a bowl and mix. Roll out the meatballs and dust with flour. Bake on lined trays till JUST browned. For the sauce, saute the onion and garlic. Add cinnamon and stir for a minute or so to release the flavour. Add the tomato paste, can of tomatoes, stock, sugar, dill and about a cup of water and simmer for half an hour or more. 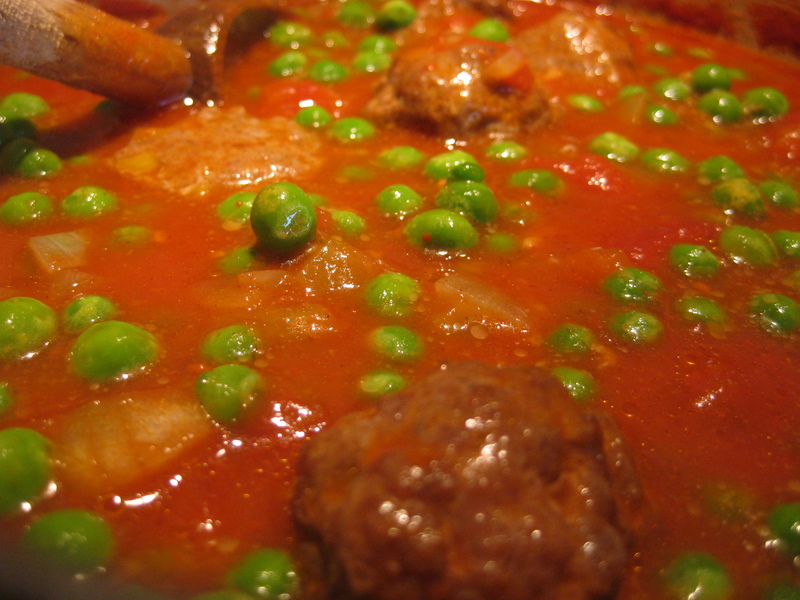 Add meatballs and peas and simmer for another 15 minutes. Season and throw in the mint. Serve with mashed potato.